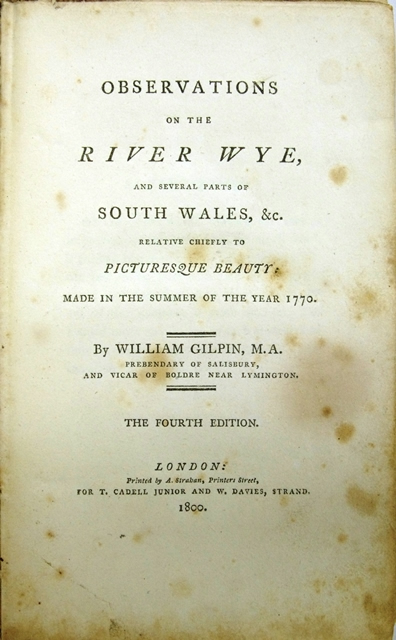 Observations on the River Wye, And Several Parts of South Wales, &c.
Relative Chiefly to Picturesque Beauty: Made in the Summer of the Year 1770. London: For T. Cadell Junior and W. Davis, Strand, 1800. The fourth edition. xvi,160pp. Green cloth of spine & brown boards. Front & rear cover sl.stained. Side of covers sl.rubbed. Its spine sunned & stained. All edges partly sunned. Sl.spotted on front & rear fly leaf. Pencil underline on some pages. A small spotted on several pages. 17.3x11cm.